Ownership / Access: Currently houses the Museum of the Samnium. Notes: Rocca dei Rettori (also known as Castle of Manfredi) is a castle in Benevento, southern Italy. 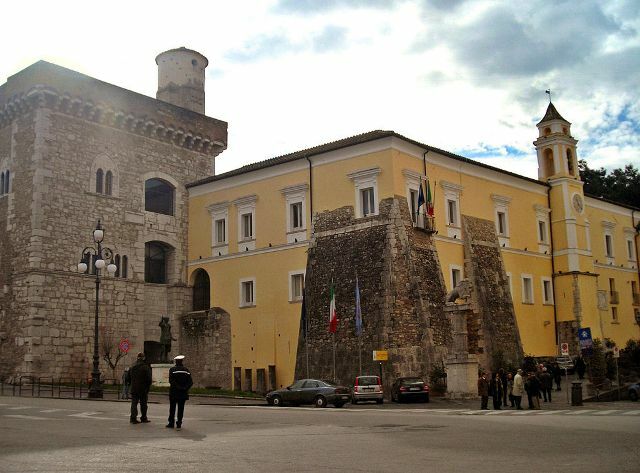 It currently houses the Museum of the Samnium.The Rocca is located in the highest point of the historical center of Benevento. The current appearance is the result of numerous renovations and additions along the centuries. It is composed of two main bodies: the Big Tower (Torrione), built by the Lombards, is the only visible remain of their original fortress, although it has been restored several times, until in the 15th century it obtained the current appearance (and is thus known as Castrum novum, "New Castle"). The Torrione has an elevation of 28 meters. The walls include fragments of Roman edifices (especially in the eastern side) and has ogival double mullioned windows. The terrace has two turrets.